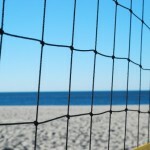 Being a supplier of tape products used for temporary gym floor marking, this blog usually doesn’t spend much time on the outdoor game-sand volleyball. Still, we couldn’t ignore this story, since it has local interest. We are located in Chapel Hill, NC and want to congratulate our town on opening up three new sand courts in a local park. The remarkable part of this story is that the bulk of the cost of construction was covered by contributions from volunteers. Between raising $17,000 and putting in lots of hours of on-site labor, the courts were ready for paly this month. A tip of the hat to Carrboro High School volleyball coach, Steve Scanga, who headed up the project.